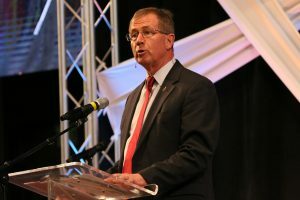 “I yearn for a Church that is sold out for the gospel and fully committed to sharing it with a world that needs it so desperately,” said Bishop Scott Jones at the Wesleyan Covenant Association’s Third Global Gathering at Mt. Bethel United Methodist Church in Marietta, Georgia on November 3, 2018. Jones, the episcopal leader of the Texas Annual Conference, challenged an audience of over 2,500 people to stand unashamed for the gospel, to ponder the amazing work of God’s grace through Christ, and to consider the profound task he is calling us to in light of that grace. You can watch and download the entirety of Jones’ message by clicking on the play button below. You can also watch and download other messages from the 2018 Global Gathering here. Additional messages from this year’s Global Gathering will be released in the coming days.